On this page, Western Sidereal epemerides (ie, Fagan-Bradley ayanamsa), Heliocentric, Midpoint, and the celebrated Tables of Planetary Phenomena. These had previously been published by Neil Michelsen's Astro Computing (later, Astro Communications) of San Diego. With one exception, they are now published by Starcrafts Publishing, of Exeter, NH. This is the creation of Michelsen's wife and heir, Maria Kay Simms, after the demise of ACS. I wish her much success. 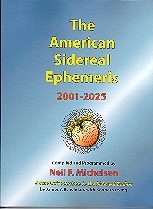 For each of the ephemerides, there are sample pdf files. They were scanned at 100% size, 600 dpi. With a cable modem they load rather fast. PDF files can be enlarged, to see all the details. For Tables of Houses, see Tables of Houses, Calculation Aids, etc. 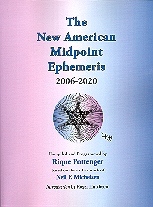 The ephemeris, 2001-2025, one month per page. Comment: Positions based on the Fagan/Bradley Ayanamsha popular in the US. 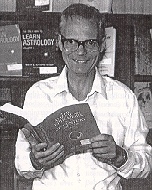 In the introductory pages, Eshelman & Irving tell how the exact start of the zodiac (zero degrees Aries) was determined between 1944 & 1957 by Cyril Fagan & Donald Bradley. This was largely the result of experimentation with solar & lunar returns & accounts for some of the more esoteric calculations in this book. Students of Vedic astrology will note the resulting ayanamsha was, as of January 1, 2001, 53 minutes, 2 seconds behind the tradtional Lahiri, which was determined by different means. See a sample page here (pdf). Starcrafts Publishing, unpaginated, 308 pages, oversize format. Comment: Two months per page. For Mercury, Venus, Earth & Mars, longitudes & latitudes are given daily. In a heliocentric ephemeris, there is no Sun (the Earth always being exactly opposite where the Sun would normally be found) and there is no moon nor lunar nodes, since, from the Sun, all planetary moons are insignificant. For Jupiter, Saturn, Uranus, Neptune & Pluto, longitudes & latitudes are given every five days. There are no retrogrades, since, from the Sun's point of view, retrogrades cannot exist. On the first of every month are given Radius Vectors, which is the distance of each planet from the Sun, expressed in Astronomical Units, where one AU = the Earth's mean orbital distance. A small "p" or "a" next to the value indicates the planet reaches Aphelion or Perihelion sometime during that month. On the first of every other month, six times a year, planetary nodal positions are given. These move very slowly. 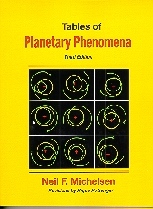 Mercury's node, the fastest of all the planets, will move 36 minutes of one degree over the 50 years of this book. There is also a full aspectarian. Set in GMT, but in a non-standard AM / PM format, which I think unfortunate, since we normally associate AM / PM with local clock time. 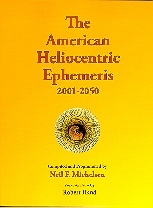 Rob Hand's introduction is a brief survey of heliocentric astrology, with an emphasis on the works of T. Patrick Davis. Starcrafts Publishing, 308 pages, oversize. The Ephemeris, 1900-2050 at Midnight, positions given every five days. 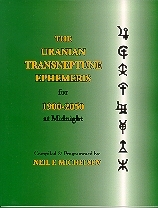 This is the successor to a number of previous Transeptunian ephemerides which Michelsen either published or had a hand in arranging for publication, going back to 1978 & Uranian Publications in Franksville, WI. In her introduction, Simms says Michelsen's final calculations (circa 1990) were about 1' (one minute of one degree) different from earlier calculations. With bodies that struggle to move more than six minutes a day, this is slight. Simm's one-page Introduction is a good overview of the subject, touching on calculation, the actual existence of the TNP's (well, they just don't, alas), major developments in what is officially termed The Hamburg School, and other sundry matters. The ephemeris itself is printed in good, clear print. You will note the dates of stations are given at the very bottom of the page. For a pdf at 100%, go here. Comment: This is based on the previous work of Neil Michelsen. The book has been expanded to include midpoints to Ceres. This is in keeping with the recent publication of The New American Ephemeris 2007-2020, where Ceres has been inserted between Mars and Jupiter. This had been published (by ACS) in five year intervals, ending in 2005. See a sample page here. Be sure & hit the magnifier, as it will initially look small. Do we know where the planets really are? How many different kinds of stations can a planet have? Part 2: The sun is not the center of the solar system! Comment: Michelsen's last book, an interesting compilation of tables & articles, by himself and his associates. 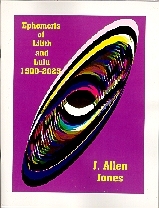 The cover says, "Third Edition", but the book appears to be identical to the second revised edition of 1995. For both Lilith & Lulu, positions given every ten days. For each, also includes instructions for use. As the ephemeris was computed based on Lilith/Sun conjunctions, there is a list of dates of Lilith/Sun conjunctions. This is also true of Lulu, where dates of Lulu/Sun are given. Lilith is a secondary moon of the earth. Back in the 1930's my list of noted correlations with Lilith contained numerous "dangers" - venomous bites & stings, food poisoning of a serious nature and some dangerous infections. A couple of miscarriages, but not one fatality, although there were two or three miscarriages. There are no interpretative suggestions for Lulu, or even any hint of what it is. Going by the positions, it is a third moon of the earth, it orbits once every seven months or so.